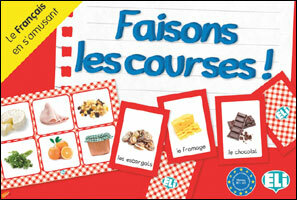 Faisons les Courses will help children to consolidate and revise correct use of French vocabulary and language structures related to shopping. Various food and drink items are presented in a fun shopping situation which will expand vocabulary and improve communication skills. As many of the foods presented are typical French fayre, this game is also good for cultural awareness. Box contents: 66 photographic picture cards (representing two levels of difficulty), 36 "shopping list" game boards (with bingo cards on the reverse), suggestions for other activities, a food quiz, recipes and game instructions. This game is aimed at children learning French as a second language and is suitable for beginners and above. Ideal for ages 7 - 14 (Key Stage 2 and Key Stage 3).